FOI Man considers what he would change about the FOI Act – and struggles. Recently I was asked what my FOI wishlist was. If I could make any change to FOI what would it be? And I struggled. Despite ten years (in one way or another) working in this area, and almost a year of blogging about it, I found myself thrashing wildly about and failing to come up with something convincing or worthwhile. I wondered why that was. After a week or so, I think I know why I found this question so difficult. The truth is that I’m not particularly convinced of the need for massive change to the FOI Act. When I look back through the last year’s posts, it becomes clear to me what my view on this is. The problems that do exist with FOI are all to do with attitudes to the legislation and the openness agenda. Very few are to do with the legislation itself. On the inside of the public sector, the problems as I see them are a continued cynicism from some at the highest level, and a failure to understand the benefits that greater openness will bring. On the outside, the issue is irresponsible use of FOI – the vexatious requesters, the people who see FOI as a handy method of beating up public officials that for whatever reason they despise, the ones who fire off huge numbers of requests without any consideration of the public money that will have to be spent. These attitudes are the biggest threat to FOI. The legislation itself is not perfect – nothing is. But it pretty much does what it says on the tin, to borrow a phrase from commercial marketing. It has freed up public sector information to a massive degree within a very short period. It’s easy to focus on the things that aren’t quite right or could be better, and there’s nothing wrong with that. But we ought to remember that the majority of requests for information are fully met. When complaints are made to the Commissioner or the Tribunal, those bodies take a much more pro-openness approach than anyone dared hope before 2005. They have set a high bar and public bodies are, by and large, learning to reach it and sometimes even exceed it. It’s worth remembering what an ambitious target the FOI Act set. Not only was it aiming to produce a massive culture change at the heart of Government, it was also asking thousands of other public bodies, right down to your local chemist, GP and school, to embrace that change. Bodies that most people hadn’t even realised WERE public bodies. The fact that most of the time people DO get information when they ask for it means that FOI is working. The picture in the average public sector office right now is not what it was seven, or even five years, ago. Not only FOI Officers but also other public servants are casually familiar with the requirements of FOI. It is still scary for them, but it is no longer shocking. The key, in my view, is gradual, but constant change. The current Government has so far made it very clear that it wants more transparency in the public sector. Its recent consultation paper on open government and the FOI provisions in the Protection of Freedoms Bill both make broadly sensible proposals to enhance the FOI Act, especially in relation to publication of datasets (as long as we can get better definition of what a dataset is, of course, but that’s another post). I’d encourage anyone reading this post to make sure that they respond to the consultation. The priority for me is protecting the rights that we do have (and I say ‘we’ deliberately – many public employees have used FOI outside of work). I have to say that many of the suggestions for reform of FOI that I hear – and even some that I’ve thought about – are, when it comes down to it, about restricting these rights. Whether it’s charging for requests, placing a limit on requests, or whatever it is, they’re all about cutting down on FOI requests. We have to question our motives for wanting to restrict a right this hardly won. In my view, this Government should focus on making very clear that it supports FOI, and specifically the right to make FOI requests. It should lead from the front and keep publishing more information. It should firmly refuse any suggestions from senior public officials or politicians to water down FOI. In the meantime, the Information Commissioner’s Office and the Ministry of Justice should find better ways to provide support to public bodies in meeting their obligations – the ICO can’t always rise above the fray. And they should do more to encourage responsible use of these rights by those making FOI requests. We need to keep progress going, but let’s not lose the chance to continue winning over influential critics. Resist more restrictions certainly – backwards is not the right direction. But we need to be careful not to destroy a growing acceptance and even, possibly, nascent enthusiasm to find new more transparent ways of working by only noticing the weaknesses and pushing too hard. In a forthcoming post, I will talk about the ‘tweaks’ that I think could be made to the FOI Act without damaging the rights we have. What if the Requester became the Requested? September 9, 2011 / FOIMan / Comments Off on What if the Requester became the Requested? 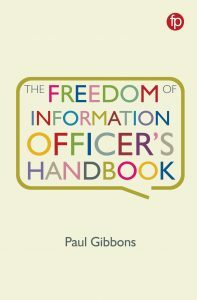 In these hallowed pages, you’ve read on many an occasion of the concerns that some in the public sector have about FOI. Some of those concerns I sympathise with, some I don’t. One thing that is predictable, by and large, is that journalists won’t. Now I love the ladies and gentlemen of the Press. Well, most of them, anyway. But I’ve often wondered if their views of FOI might be affected if they experienced working in an FOIable world. It’s very easy to criticise delays if you’ve never had to juggle the main work that you have to complete with one or more demanding FOI requests. And the use of exemptions to withhold information can readily be painted as a lack of commitment to openness if your emails have never been the subject of a statutory duty to disclose. (Although some media organisations are probably getting more used to that these days, come to think of it). A bead of perspiration ran down Bill’s forehead. A hot summer day, but he hadn’t the time to join his colleagues in the pub. Bill was writing up the scoop of his life. This was the kind of story that could make a journalist’s career. All he had to do was get it to his editor by 7. The phone rings. Bill sees who it is and sighs. He picks up. Bill knew she was right. The paper had had some bad press itself lately, and this would add to their troubles. So Bill dropped his work on his scoop. The FOI, funnily enough, was asking for copies of all correspondence relating to the story he was working on. It was speculative, from a journalist on another paper, but it happened that all his key evidence was relevant. He’d put months of work into this story, but some hack who had got lucky with a fishing expedition was now going to get the fruits of his labour for free. His only hope was to get his story out first. But he’d already lost three or four hours pulling together the information for Sarah. He finished forwarding the relevant emails to her, and looked at his watch, yawning. He had to get home, and if he wasn’t careful, he was going to miss the last train. Oh well. Another day tomorrow not even touched. The next day, Thursday, Bill completed his piece. He forwarded it to the Editor for approval. Nothing. He checked with the Editor’s PA. She was busy all afternoon with the Head of Law and Sarah, considering a request for internal review in a case where there were five boxes of papers. They’d have to read every sheet to work out if anything could be disclosed. When he did eventually hear from the Editor, it was to say that she’d need to consider the story carefully as there were legal issues. Bill sighed, pulled on his coat and headed off to meet his source and buy them dinner. He watched with some consternation as the Source chose the most expensive item on the menu, before selecting a fine wine. That was a hundred quid he could wave goodbye to. In the old days, he might have claimed for dinner on expenses, but since an MP had made an FOI request for all journalists’ expense claims and receipts two years ago, he was afraid to claim for anything. He had just managed to escape with his job from the resulting furore, though his claim for a pigeon coop had caused much mirth in Parliament. Friday morning. Heading to the station, Bill stopped off at the newsagent for a packet of paracetamol and the morning’s papers. He stopped aghast as he laid the papers on the counter. There, on the front page of the Daily Jupiter, is his story. It is illustrated with a huge image of one of the emails that he’d sent to Sarah two days before. He nearly forgot to pay in his rush to get to the office. It was time to go freelance. It’s worth pointing out that if the media were subject to FOI, it is likely that they would benefit from the same derogation that the BBC and Channel 4 have for information related to their journalism (and which often attracts criticism from other media organisations). But hopefully this story illustrates the point that often dealing with FOI requests involves people central to delivering public services – senior nurses, doctors, lecturers, social workers, etc. 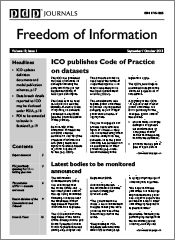 And even with a derogation, FOI has implications for how an organisation is resourced. I’m sure this sketch bears little relation to a real newsroom. I’ve never worked for a newspaper, so I’m basing this on too much TV and a fertile imagination. But perhaps it might illustrate to some why public sector bodies sometimes struggle with FOI. FOI Man looks at the Government’s latest proposals for FOI 2.0. The Government has launched a new consultation looking at Open Data and transparency in public services. I’m all for progress in this field. phased introduction of new generation of ICT systems that facilitate publication of data. I don’t have a significant problem with individual proposals here. I worry about the practical implications of making it all work, especially at a time when the public sector is cutting staff. But I’m sure that Government, enlightened by the responses to its consultation, will factor all that in and make sure that adequate resources are provided. My main concern is the general tone of this section of the report. In common with many reports by this Government, the underlying message is that public sector bodies and their employees are the problem. In this case, we’re clearly doing all we can to thwart openness. We’re only refusing requests that exceed the ‘acceptable limit’ because we can. All internal reviews are being delayed as long as possible, just because we can. We’re deliberately procuring ICT systems that make it difficult to publish data just so we can argue that it will cost too much to publish it. No, no, no. I’m sure that some of you reading this will immediately respond that that reflects your experience of public bodies and FOI. And no doubt you have had bad experiences, or felt that you’d had a bad experience because your request was refused. But just because you didn’t get the outcome you wanted, or you had a bad experience with an authority that got it wrong, doesn’t mean that all public bodies are actively anti-openness. As I’ve tried to make clear in this blog on a regular basis, the biggest obstacle to openness is the resource implication. Not only does it stop you getting information when your request exceeds the ‘appropriate limit’, but it’s also behind 90% of the disputes that I have with colleagues over disclosure – they’re not secretive, they’re busy; and the experience of having to carry out their main function whilst also digging out information poisons the minds of some officials to FOI in the long term. It’s a real issue. And you can hit us over the head and tell us how awful we are as much as you like, making FOI and openness work is about winning people round so that they can think about these issues positively rather than under duress. requiring public authorities to publish their statistics for FOI compliance (after all, how can the Commissioner ‘name and shame’ authorities if they’re under no obligation to publish or return such statistics). This would be all along side more pro-active disclosure. But it all needs to be balanced against the ability to provide a workable service. Change, yes, but let’s make it gradual and realistic. Earlier this week I was lucky enough to attend the Information Commissioner’s Data Protection Officers Conference in Manchester. Don’t be misled by the name though – there was plenty to entertain us FOI obsessives. 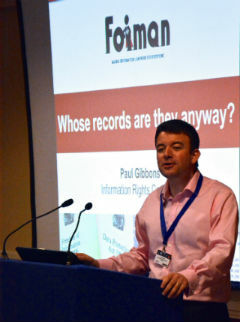 From the keynote speech from Lord McNally, the Lib Dem Minister of State in the Ministry of Justice, through to the Commissioner’s closing remarks, this was a conference that aimed to fully integrate the Commissioner’s Data Protection and FOI duties. So what was there that caught the eye on FOI? It was clear from Lord McNally that support – and opposition – for FOI and openness issues is cross-party within the Coalition. He spoke of his surprise at finding himself on the same side as Francis Maude and Eric Pickles in meetings. In questions, it became clear however that there was some dispute within Government over whether FOI should be extended to the private sector when it provides public services. Some in Government are sceptical as they argue that this would deter companies from bidding for Government contracts. From the tone of the Minister’s response it appeared that there is some fierce debate going on in Government on this very issue. Interestingly, Graham Smith of the ICO later argued that the private sector was effectively covered under the existing Act, as FOI continues to cover services provided on behalf of public bodies. Lord McNally stated that the changes to the Information Commissioner’s role proposed in the Protection of Freedoms Bill were designed to strengthen the independence of the Commissioner. The Commissioner himself welcomed them later in the day, though he did suggest that if the Commissioner is only to serve one term, that term ought to be longer. The Orders bringing ACPO and UCAS under FOI will be laid at some point from October this year. My guess, based on nothing in particular (other than neatness), would be that the aim would be for the order to come into force on 1 January 2012, but perhaps it will take effect instantly. I know that ACPO have some excellent people helping them prepare for this, and I’m sure it’s the same picture at UCAS. Lord McNally also spoke about the changes to the 30 year rule for Public Records. He explained that the long lead in time is because the move to a 20 year rule is an expensive exercise. Post-legislative scrutiny of FOI is seen by the Minister as an important step after 6 years of the Act. The fact that issues will be aired in a public forum will help in developing proposals to amend the Act further. We also heard from Katie Davis of the Cabinet Office. It was clear from Katie’s presentation, as from the Minister’s speech, that the Government really does attach great importance to opening up public data. The Government’s aim is to be the most open and accountable government in the world. She explained that the Government’s Transparency Board, chaired by Francis Maude, was challenging assumptions across Whitehall. Its membership is certainly impressive – as well as ministers, it includes luminaries such as Professor Nigel Shadbolt (whose Southampton University home launched their open data repository this week) and Sir Tim Berners-Lee (inventor of a little thing called the world wide web). It was good in questions to hear her comment that Local Government is leading the way on transparency. A question mark still remains over the impact of open data initiatives on the general right of access under FOI. Senior figures within the Information Commissioner’s Office remain as sceptical as many of us FOI Officers as to whether bulk disclosures will lead to reduced numbers of FOI requests. Graham Smith, Director of FOI at the ICO, struck a cautious note. He commented that FOI was certainly embedded in the public sector; everyone knows they have to comply, but whether they want to is very much another matter. There is a culture of compliance rather than openness at present, in his view. The Government’s transparency agenda is very much welcomed by the ICO. Graham spoke of a lack of political direction on openness in the past which has contributed to lack of progress in changing the culture. An interesting point raised by Graham was the fact that our FOI legislation was very much designed with paper record-keeping systems in mind. Now that much of the work of Government is carried out electronically, does that affect the effectiveness of the Act? Finally, he observed that the private sector appeared to be ‘waking up’ to FOI. Not just in terms of using it, but in realising the implications of FOI for their dealings with the public sector. Later in the day, there was the message that public sector bodies shouldn’t be afraid to apply the provisions for vexatious and repetitious requests where necessary. Similarly aggregation of requests when estimating costs. The ICO will be supportive when looking at these cases where it is clear that requesters are making significant numbers of requests or are harassing authorities. It was clear that this attitude was coloured in part by the ICO’s own experience with some requesters! Public bodies should also be careful to protect personal details of their employees – in many cases, these details will still be protected by the Data Protection Act and section 40 ought to be utilised. The Commissioner raised a laugh at the end of the day when, following his best impression of the former Prime Minister expressing his regret over FOI, he exclaimed, “Tony, it wasn’t about you!”. He reminded FOI Officers that we should be on the side of Dr Samuel Johnson – a famous exponent of openness – and not that of Cardinal Richelieu, who believed that secrecy was the first requirement of Government.